Tue, March 11, 2008: Cleaned up text and updated better photos illustrating how to erect a yurt, and added information about storm preparation. Tue, February 19, 2008: Added a few thoughts on "crownless" yurt roof approach. 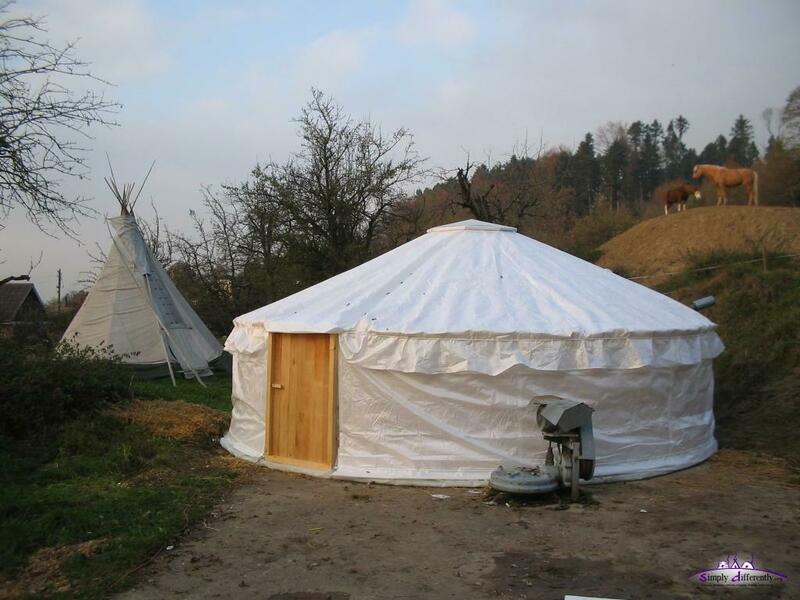 Fri, December 8, 2006: Update on Standard vs Non-Standard Yurts (How to derive a standard), and various minor updates like on stove / pipe options. Sun, November 5, 2006: Updated infos on thermal insulation with straw filled jute blankets. Mon, October 30, 2006: More infos and calculator assistance for pieslice-wise roof canvas. Sun, October 22, 2006: Added more detailed information about "attached room" option and calculator. 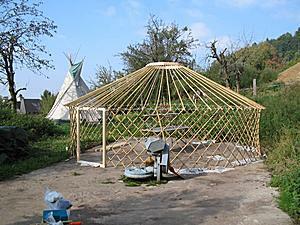 Wed, September 20, 2006: Added overview how to erect a yurt with photos. Sat, September 9, 2006: More details on options to bind the lattice wall / khana. Mon, August 21, 2006: More details on wall / khana section junction methods, even and odd amount of junctions/poles, half and full twin junctions. Fri, July 7, 2006: More detailed instruction how to make a door based on vertical laths. Wed, April 26, 2006: Update on thermal insulation. Mon, February 13, 2006: Added more pictures of wall composition, and inserted a page break, now 5 pages totally. Wed, January 11, 2006: Minor refinements and additions. Wed, December 21, 2005: Added toono/wheel interactive sketch. Fri, November 25, 2005: Added photos of toono cover construction. Fri, November 11, 2005: Added more information on Insulation and Stove Pipe positioning with photos how I did it. Sat, October 29, 2005: Floor calculator rearranged and floor rendering. Improved yurt rendering. Wed, October 5, 2005: More on floor building. Sun, October 2, 2005: Floor calculator, and more info on building the floor. Canvas calculation fixed. More details on toono cover using clear PVC. Mon, September 26, 2005: Details on door construction (example). Sun, September 25, 2005: Added more details on khana, especially the termination of the khana-section. Sat, September 24, 2005: Corrected n-polygon toono calculator for l0..2. More information on the khana and details on the door. Fri, September 23, 2005: Corrected npoles, now assume 6cm for top and bottom extra by default. Sat, September 17, 2005: Added small toono n-segment calculator. Fri, September 16, 2005: Added more detailed wall canvas calculation (hint if multiple lanes are required). Fri, September 2, 2005: Minor updates on roof canvas, added illustration. Fri, August 26, 2005: More details for roof lanes, wroofextra added to have spare roof canvas. Thu, August 18, 2005: Roof lanes calculation added (to patch one big canvas). Tue, August 16, 2005: Toono (crown wheel) construction added, and Î±khana flexible (usually 90 °). Sun, August 14, 2005: more detailed illustrations, more description in results. Thu, August 11, 2005: nlaths corrected. Tue, August 9, 2005: First public release, yurt interested people informed. Welcome to my personal "Yurt Notes". 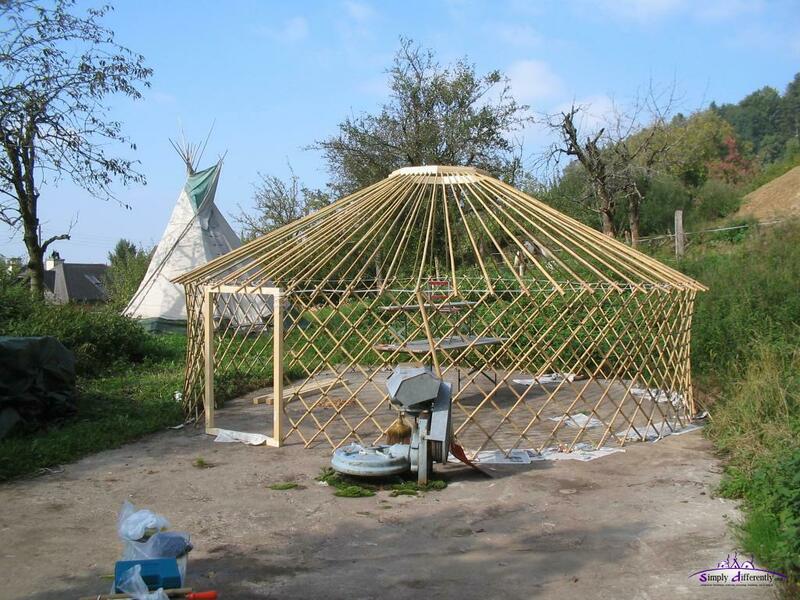 Check out the manuals first to get an idea about the overall considerations to build a yurt. Additionally I wrote down some of my notes and calculations I made myself and implemented a "Yurt Online Calculator" based on those calculations. Also, a lots of hints I received from people I visited who also build their own yurts have been included here. I developed my yurt (11/2005) according these notes, and I still add and edit those notes here occassionally. If you do use this calculator and these notes to build a yurt, drop a note so I can get an idea how useful these notes and the calculator actually is. My email address is at the bottom of the page. I consider the lattice-wall (khana) build by laths (or sticks) and angled by αkhana (usually 90°, but smaller also possible, then the lattice wall / khana rises) to each other to create a lattice. The roof-poles are assumed to lay on the top lattice crossing of the wall / khana, with a space of w as seen on the illustration. 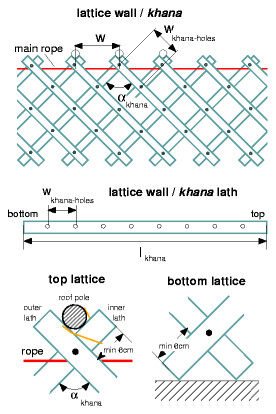 All laths of the lattice wall / khana have the same amount nholes of holes, and the same distances wkhana-holes. The top crossing needs to have enough space to carry the roof pole/lath. Of course if you decide to not lie the roof poles on the lattice end crossings, then you can choose your own lattice-wall geometry and choose the amount poles yourself. 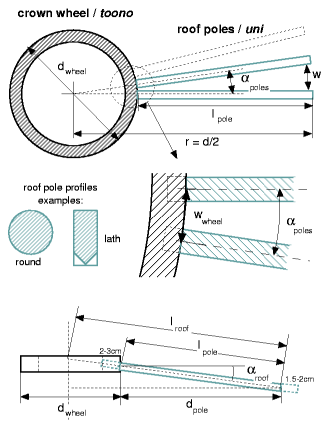 The poles are inserted into the toono (crown/roof wheel), with αpoles separated, or wwheel at the toono, this wwheel minus space determines the max diameter or width of the roof pole/lath. The roof poles (e.g. bamboo sticks) and angled by αroof, e.g. 20-35 degree, to form a tilted roof. The final roof pole length is longer than calculated, as some space is required to enter the toono/wheel, and also for the tail of the roof pole to reach beyond the wall, I suggest 1.5cm to 2cm additional beyond the hole with the cord, which is used to insert at the wall lath (the inner wall lath to be specific). So, the total roof pole length is 4-6cm longer as calculated, so keep this in mind. 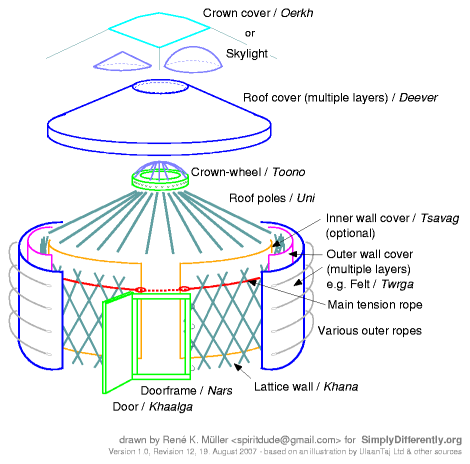 If you are not interested in the math of the yurt, just skip the next paragraph and jump to the next page where you can enter the geometry of the yurt, and get the detailed measurements of the components.